I truly adore Ethiopian food so I needed no persuasion when Matthew suggested having some at the weekend. I was doubly excited because I had a new ingredient to try – shiro. Anyway, I also buy a few injera there and stash them in the freezer. I have made them, and the biggest success I had is with a cheater version which didn’t make into Vegan Eats World (the one in there isn’t the same) but the mice keep eating my precious teff flour, so I’m grateful for another speedier option. 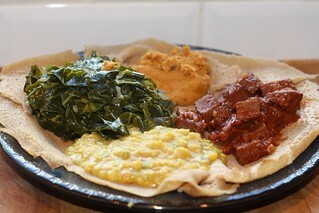 The four dishes you see on the injera are: Kik Alicha (yellow split pea stew) from Papa Tofu, Ye’abesha Gomen (greens) from Papa Tofu, Shiro (as above) from Papa Tofu, and the Seitan Tibs from Vegan Eats World, but made using the Niter Kibbeh (spiced vegan butter) from Papa Tofu because it’s one of my favourite things in the world. I’ve made a reasonable amount of Ethiopian food but this was my favourite combination so far. I used a very spicy berbere (spice blend) in the seitan, and that worked perfectly with the creamy split peas and intensely buttery silky shiro. After a long day sale shopping just after Christmas we ended up at Koreana in Manchester and had a fantastic meal. I enjoyed it so much I was inspired to cook a Korean meal for our New Year’s Eve dinner. I have cooked Korean food before but I’ve branched out since then, made my own kimchi, and got Vegan Eats World, which contains a number of exciting looking Korean recipes. 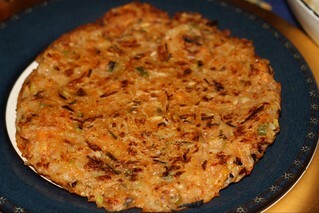 The picture above is of the kimchi pancakes, which were my favourite part of the meal. We had them in Koreana and I didn’t think I’d be able to reproduce them as I’m traditionally pretty rubbish with pancake type cooking, but Terry’s recipe didn’t let me down and they worked perfectly. The rest of my pictures are pretty appalling but I made the Bulgogi from Vegan Eats World – a stunning BBQ mix of seitan, mushrooms and tofu. The Dolsot Bibimbap, also from Vegan Eats World, but without the tofu, as there was tofu in the bulgogi. We also had this at the restaurant and loved it, but I think they must have flavoured the rice there and I’d do the same again next time. I really enjoyed the spinach, beansprout and spring onion toppings. I added the potato chorim from Asian Vegan Kitchen, which I made last time, and the courgette namul from the same book, just because I had a courgette that needed using. Once again I really loved the Korean flavours from this meal. They’re totally different to other Asian cuisines with an underlying sweetness livened by an abundance of sesame and gochaguru (Korean chilli powder). All the dishes worked well together and Matthew opened a bottle of wine that went perfectly with them. Incidentally, we used to have to ask Tanners to send us their vegan lists, so we’re delighted they’ve started labeling the wines on their website. I’ll definitely be cooking Korean food again – these recipes, and I’m looking for any other recommendations too!